story of Mary and Martha from Luke 10: 38-42 And began by asking “how many minutes of uninterrupted time do we spend with Christ every day?” “Every week?” “Every month?” That is a thought provoking question. If you follow Jesus, you need to be honest with yourself and ask that very question. If the answer is too few to avoid embarrassment, take courage, there is hope, we can do this. Read on. If you know anything about Whoville you know something about the Grench. The Grench does not like noise. 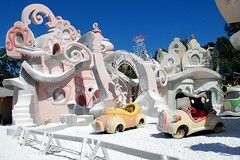 Whoville was full of activity and the noise that accompanied the activity. Martha was distracted with much serving. Mary knew what was best and Jesus promised her the good thing will not be taken away from her. What do you observe about Mary in this story form Luke? Does Mary say a word here? Mary is a model of what our objective is today. We want to learn to be like Mary–to sit at the feet of Jesus and be silent. Mary chose the good thing. The good thing was to sit and be silent before the Lord and listen. Mary was learning what rest meant. What is rest? Consider this definition. Rest is a disposition of the soul or attitude of the heart, characterized by an inner calm in chaos, a stillness in the storm, a pace of schedule ( includes a balanced rhythm of work and repose; of withdrawal and engagement; stillness or silence and activity) allowing quiet trust and sweet surrender to His will. Well, that is not mine–it is my pastor’s definition but I like it. We need to focus on this balance which we all fail to achieve so often. If you only get one thing from this passage–take this: the emphasis here is on Mary and her disposition of being at the feet of Jesus, silent and listening to His words. Psalm 62:1 tells us to wait on God in silence. See also Psalm 4:4-5. If you look at the end of Jesus’ life, you will see what happened to the Apostle Peter. He was devastated by his own sin of betrayal. He felt the weight of his sin, repented and rested. We see what being still and resting can do in the beginning of the book of Acts. Peter preached and 1000’s were converted. Being still before God produces great fruit. Stillness before God causes us to focus. That focus produces the right response, in the right way and at the right time. When we focus on what He leads us to be involved in we are blessed with his power to do what He calls us to do. Our focus and His power leads us into greater worship of Him as we see the fruit of what He wants to accomplish in us. Mary worshipped Jesus here. Martha was distracted with her task list. Psalm 73:17 shows us that we can be still before God and let Him work out our circumstances for His glory and our good. Let me ask a few questions. Do you long for the rest that Jesus offers–that we see Mary getting here or are you fighting the thought of rest? What is the energy behind your choice right now? What is your greatest distraction right now? Is your life about yourself or is it about Him? Contemplate what you will loose if you refuse to rest. What is at stake here?